We were moved to tears when Joe Barksdale — professional football player, musician, husband and father — reached out to Calm to share his story. 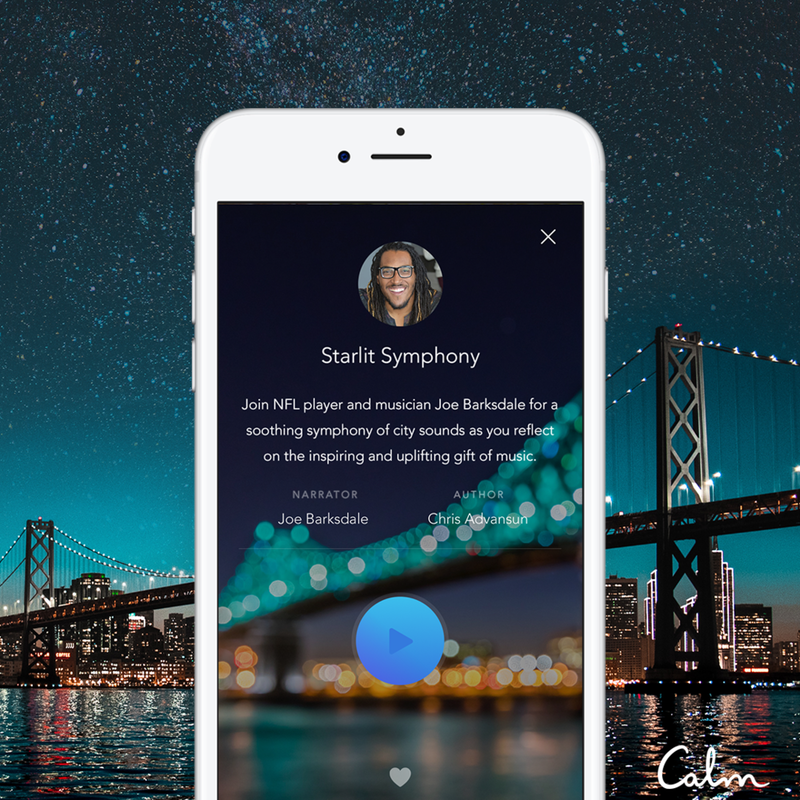 After a traumatic childhood and years of struggling with depression, he downloaded the Calm app and it changed his life. Joe wanted to tell his story in the hope that it might help others who are struggling with their mental health but maybe think that meditation isn't for them. After all, a football player isn't usually the first image that comes to mind when someone says the word meditation. Meditating with Calm has not only improved Joe Barksdale's athletic performance as an offensive tackle for the Los Angeles Chargers in the NFL; it's also helped him with everything from playing the guitar to cultivating healthier and happier relationships. Joe loves the Daily Calm; he describes the 10-minute guided meditation as the bar between the peaks and valleys of his day. He also enjoys the nature scenes, Calm Masterclass, Calm Music and Sleep Stories — he's yet to make it past five minutes of any of Calm's Sleep Stories. According to the World Health Organization, over 300 million people are suffering from depression worldwide – and many of them are left to face their mental health battles alone due to stigmatization and lack of resources. Amidst this devastating health epidemic, it's hopeful that more and more people, including top male athletes like Joe Barksdale, are speaking openly about their struggles with depression. The video above is an unpaid testimonial with the goal to spread the life-affirming power of mindfulness, a good night's sleep, and a deep breath. In fact, Joe is so passionate about helping other's that he also narrated a Sleep Story – again giving his time unpaid – in the hope of helping others facing their own mental health battles. The new story, specially written for him, is not about football but – at his request – about his “true passion” of music. Called Starlit Symphony, it’s about a musician who has just finished writing a new piece. He then steps outside for an evening walk and ends up reflecting on how important music has been in his life as he takes in the stars and city’s sights and sounds — the Starlit Symphony. Barksdale, meanwhile, has just written and released his own first album as a musician – called Butterflies, Rainbows and Moonbeams. "My relationship with music goes back as far as I can remember. From my dad playing old Marvin Gaye and Al green songs, to my mom listening to Earth, Wind and Fire, and so forth. The first song that I can remember hearing and understanding was Mercy Mercy Me by Marvin Gaye. I heard it in the dentist's office during my first ever visit there. I remember that the song sounded like something from outer space. The funky groove that was laid down for the rhythm and then the bells chimed in and then 'woah … aw mercy mercy me …' I was hooked!" "I remember how mellow and relaxed the music made me feel. I remember the way the lyrics rolled off his lips. I remember listening to the message and wanting to know more about what made him record that song. I wondered what other songs this man had made. I wondered what other artists were out there making those kinds of sounds. I wondered what kind of instruments were used on the track, but most importantly I wondered why I couldn't stop listening to it." "It lit a fire inside of me. I had to hear more. I had to learn more. I had to find out what I had to do to make music." Thanks for your courage and inspiration, Joe. Wishing you and the many others out there who struggle with depression more support, ease, and joy in your days ahead.